A bouncy, jaunty blues head. Clifford Brown's trumpet solo from both the master and alternate takes are available in B-flat and C editions. Dexter Gordon, tenor sax; George Gruntz, piano; Guy Pederson, bass; Daniel Humair, drums. Holland, 1964. The 2014 Vail Jazz All-Stars, Vail Jazz Festival, Vail, Colorado. 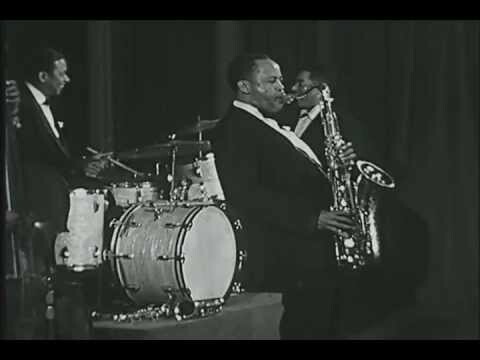 The lead sheets for this classic start with Clifford's introduction and also show Clifford's horn backgrounds and the set up for Max Roach's drum choruses. There are two recorded takes of this classic. Clifford Brown's solo from each take is available here. For years, only the incredible master take was available. The alternate take was first issued in Japan on "More Study In Brown" and was the first one recorded. Clifford and Harold Land tried something very challenging. After the last soloist (drums), before the out melody, the horns decided to exchange four-measure phrases, then two measures each, then one each and then a half measure each before starting the out melody. After they got through the first take, they decided to try it again. The exchanges were incredible on the retake, so it became the master take. Check out other titles recorded on that album. Transcribed Trumpet Solo: Our audio excerpt lets you compare the start of both takes. First you hear Clifford's break from the master take trumpet and then his break from the first take they recorded that day, which is now the alternate take. Although the rhythmic content of the the two breaks is essentially the same, the notes certainly are different. It's great that we have two solos to compare.